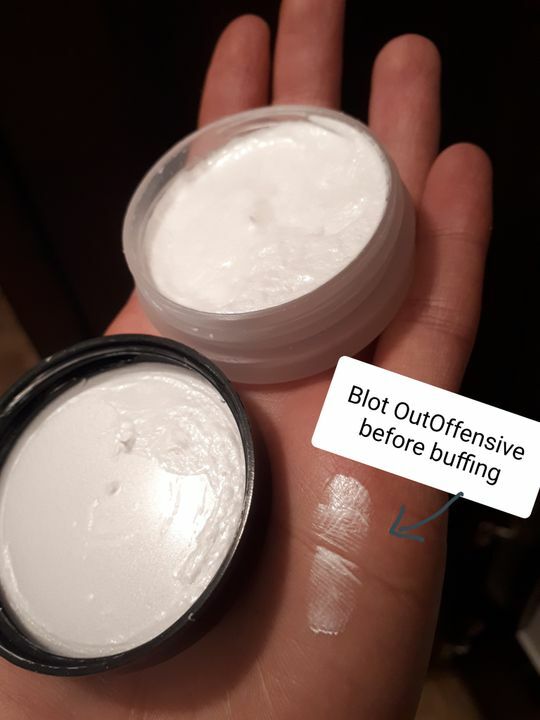 Nurturing Force Blot Out Offensive is not a gel or a liquid, but a moisturizing cream that makes shiny skin an instant matte canvas. Use as a Primer under make-up, as a barrier cream or alone. No matter which way, it will champion your need for anti-shine by providing a smoothing velvet finish to skin. Our formula is without silicone (dimethicone), without parabens, without added fragrance or color, providing skin with smoothing natural anti-aging + antioxidants through our Aloe Vera Gel First Formula. There is no stickiness or problems with streaking make-up (as with many gels and liquid anti-shine products and primers). Because our cream is massaged into the skin. Our comfortable moisturizing cream helps to protect the skin from blemishes caused by pore clogging make-up, or use our cream alone for a pore minimizing look to oily, blemished or combination skin. Apply with fingers, sponge or brush, rub into skin and you are ready to apply make-up if desired. No Sealed or Stiff Sensation, feel and look natural! Paraben-Free. Silicone-Free, No Added Fragrance, No Added Colors & No Animal Testing. Feel, See & Sense the Difference. I purchased this product in place of milk of magnesia. It doesn't control oil as well as mom. Marjorie H. Reviewed by Marjorie H.
A bit of a learning curve, but great product. It's a great product. I first heard about it from Mary Erickson, founder of CRC, on a makeup artists Facebook group : she loves it. First application might surprise you, as it first leaves a 'metallic white' film on the skin (!!). But after some buffing on the skin it disappears and the skin is perfectly matte. It looks like a marshmallow cream, but on the fingers, it has the texture of a light whipped cream. I would avoid it on sensitive skin prone to redness because of the massaging needed, but except for that, I use it on any actor/actress with oily skin. Fewer touchups gets required during filming. Best prep/prime product I've used, especially under makeup that needs to last the day under light, heat and possibly a bit of sweat. Staci G. Reviewed by Staci G.
Best product to use for clients with excessively oily skin. Keeps shine under control perfectly when actors are on set!